This Tom Anderson Drop Top Hollow Classic has a transparent teal finish, bound maple top on an alder body. Doncha just wanna dive into the finish and go for a swim? Help! Lifeguard!! I'm drowning!! Click on the photo for a much better look and specs. The almond colored body binding works so well with the teal color and the white pearl pickguard. 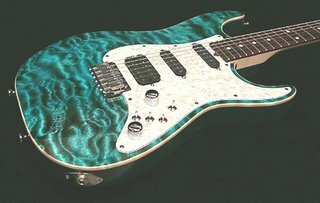 www.andersonguitars.com has tons of great looking Strat & Tele type guitars to drool over. It was real tough to narrow down and choose this one.